Posted on February 24, 2017 by Matthew Leib. This entry was posted in Faculty Friday, Spotlight and tagged Faculty Friday. Bookmark the permalink. Naomi Macalalad Bragin teaches dance. But you won’t find her teaching only steps. She’s more interested in what’s happening off-stage—underground and in the street. The assistant professor in the School of Interdisciplinary Arts and Sciences at the University of Washington Bothell is a performance ethnographer whose work places her at the convergence of dance, pop culture, media, and black political theory. Hers is a language of movement—and of a movement. 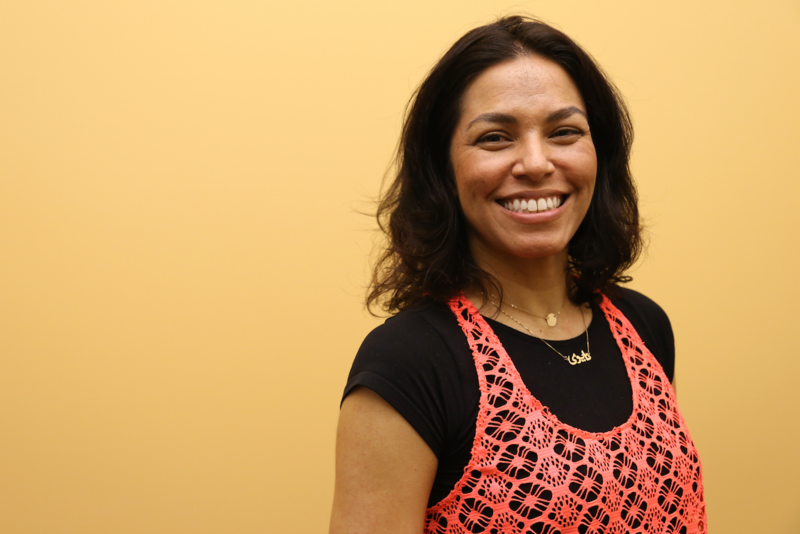 This quarter at UW Bothell she is teaching Street and Club Style Workshop, which examines the foundations of hip-hop and street dance styles from the point of view of black aesthetics. But isn’t there an inherent contradiction to teaching tenets of street dance in the studio? Yes. But, then again, that’s the point. The term Bragin uses to describe the intersection of her particular areas of interest is “kinesthetic politics.” In other words, how a body’s movement can serve as a mechanism for senses and sensations that go beyond the visual. Bragin is keen on taking the concept of kinesthetic awareness and applying it other realms—a process she cleverly dubs “kin-ethics” (“kin,” as in kinship). It gives rise to another apparent contradiction: how can you study outsider movements from inside an institution—in this case a university? Bragin engages the question head-on with students in the dance studio. In Street and Club Style Workshop, students research hip-hop as a global phenomenon through a critical new media lens, considering everything from underground competitions and reality dance shows to how it circulates in and is filtered through cyberspace. When dances like the Nae Nae or Juju on That Beat go viral and begin circulating in mass culture, people across the globe replicate the phenomena by learning the steps. What’s left unlearned, however, are these dances’ original contexts and rich cultural meanings. Somewhere along the way in the transition to global consciousness, the improvised, communicative, connective currents of hip-hop dance—and black culture at large—are sometimes lost. Bragin in no way casts herself as the sage on the stage—or in this case, the street. Rather, she describes her process as an investigation and conversation conducted with and by students. In a dance class, that means giving students the background to think about the histories and communities who have been instrumental in dance’s evolution and then asking them to question their own practices in the context of a larger conversation on how race and power influence different social configurations. So what is the difference between appropriation and innovation? Creative theft (or “biting” as Bragin and other dancers refer to it) is one of the biggest issues in hip-hop writ large. Bragin says it’s part of an ongoing process of being present and aware of the underpinnings of cultural traditions other than one’s own. Bragin grew up in Los Angeles, spending her formative years—12 of them to be exact—as a competitive classical violinist. When she got to Wesleyan as an undergraduate, she still played violin and planned to major in English, but instead found herself drawn to a dance program that embraced experimentation. She switched her major to dance and began studying improvisational expression, while also exploring the club and rave dance scenes in New York and the northeast on weekends. From there, Bragin’s education swiftly became one of dueling dualism born of the structured improvisation of the postmodern dance studio and the thrumming, vibrant dance club scenes of 1990s New York and Los Angeles. She was trying to find ways to form a bridge for those dance forms and bring them into the context of the stage and the studio at the university. Her unique participation in both led her to a Ph.D. in Dance and Performance Studies at UC Berkeley, prior to which she had been teaching in schools, community centers and transitional facilities in the Bay Area. From 2002 to 2008, she served as founding artistic director for DREAM, an Oakland street dance company that toured schools and universities locally and nationally. So where does Naomi Bragin the performer leave off and Naomi the researcher begin? For her part, she likes to keep it fluid. The truth is they inform each other. “It was a chance to think through those connections as part of a community event where everyone came together and created these collective structures in the moment,” she says. Still in her first year at UW Bothell, Bragin says she looks forward to hosting more events and engaging in similar forms of outreach, specifically gathering students on campus and engaging the University in exploring its role in the wider Seattle area. Next quarter, she’ll be teaching Theorizing Black Performance, which considers both popular and avant garde culture from the stage to the street and the relationship between black aesthetics and politics, as well as an interdisciplinary performance workshop, Doing Performance Research. For Bragin, a central question is where is studying actually happening and how can “study” evolve beyond the sheer disciplining of knowledge to a place of more equitable distribution thereof. Which is why she says she’s thrilled and thankful to be at the School of Interdisciplinary Arts and Sciences, which she feels is “committed to changing and transforming institutional politics” through creative ideas and conversations. What about the club life? It’s just not the same as it used to be anywhere anymore, Bragin says with some sense of nostalgia, but without any great sense of longing. She ascribes the change to the regulation of nightlife and the movement of wealth into cities—a world of dancing outcasts becoming classed out. Whether in dance forms or in how we see, treat, and connect with one another, Bragin says that change happens everyday on a micro level. Naomi Macalalad Bragin holds a B.A. in Dance Choreography and Performance from Wesleyan University and an M.A. in Folklore and a Ph.D. in Performance Studies from the University of California, Berkeley.